Infusing Central Western Riverside County Senior Lives with Compassionate Care | BrightStar Care " "
Every January 25th is National Infusion Nurse's Day. Do you know what an infusion nurse does or the many ways they can help your Central Western Riverside County senior loved one at home? Infusion Nurses are Registered Nurses who specialize in giving medicine and fluids to Central Western Riverside County patients through injection or infusion. They require additional training and knowledge of the techniques to perform and monitor an infusion, including the equipment as well as the often highly specialized medications they are infusing. 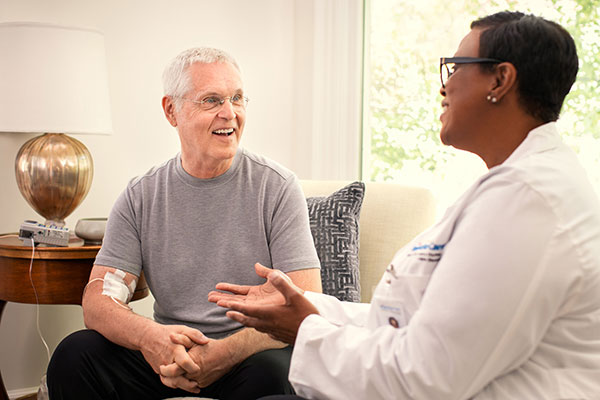 They monitor patients for their reaction to the medication being administered, manage their tubing and pumps, maintain arterial catheters, and stay aware of potential drug complications. Infusion Nurses can be found working in a multitude of locations, including places like hospitals, long-term care centers, clinics, and home health agencies. We would like to take a moment to thank all of the BrightStar Care Infusion Nurses that all go above and beyond for our Central Western Riverside County client's every day. You are the reason they are able to have their treatment in the comfort of their own homes. Thank you for all you do!